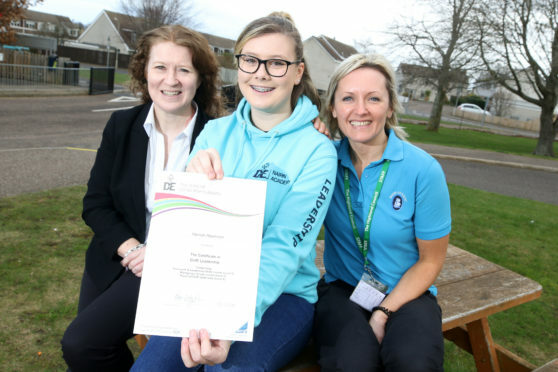 Hannah Rawlinson, who graduated from Nairn Academy last summer, has achieved the Certificate for Duke of Edinburgh Leadership, and with it has achieved an SCQF level 5 qualification. The momentous feat was achieved by working with Duke of Edinburgh tutor Kirstin Grant during her final year at the school. Miss Rawlinson said: “A lot of the work we carried out was with additional support needs (ASN) pupils and learning about how to adapt things to different experiences. “It was really inspiring to see everybody able take part in the Duke of Edinburgh but in a slightly different way. Miss Rawlinson utilised her experience from the scheme by undertaking a three-month voluntary placement at a primary school in Jamaica’s Mandeville, where she delivered PE lessons to the children. She added: “For the girls we delivered netball sessions and for the boys it was football. “It is not an overly developed country and there hasn’t been the high level of education through sport as you would expect in the UK, so we had to adapt and I was able to implement those skills from when I was working with ASN pupils in Nairn. Miss Rawlinson, who is also a prominent member of Nairn Ladies Football Club, is currently working in her hometown as well as delivering coaching to youngsters in her spare time. Kirstin Grant, the Duke of Edinburgh Leadership tutor at the school, said: “It was a really exciting platform to deliver and a fantastic opportunity for Hannah to see behind the scenes of a working Duke of Edinburgh group. “In particular at Nairn, we have an impressive additional support needs (ASN) involvement and this gave Hannah an excellent opportunity to work with children within the ASN department. “She made up a range of Duke of Edinburgh based activities for the young people to take part in which really broadened her Leadership skills.